Anyone who interacts with the Ministry of Law knows how much time they take for clearing the proposals sent by various Ministries. Even a simple amendment to the Recruitment Rules of entry level posts like Lower Division Clerks takes months to pass through the Ministry of Law. The officers from the departments which proposed the amendments are called by the Ministry of Law, sometimes repeatedly, and clarifications sought in those cases. Such a Ministry created a record of sorts on 26.6.2009, when it cleared the multifaceted proposal sent by the Ministry of Labour for amendment of the ESI Act, 1948, ( later ESI Amendment Bill No. 66 of 2009 ) in spite of the fact that that they were very complex proposals with far-reaching consequences. 1. The proposal concerned had been received by the Advice Section of the Ministry of Law on 24.6.2009. 2. 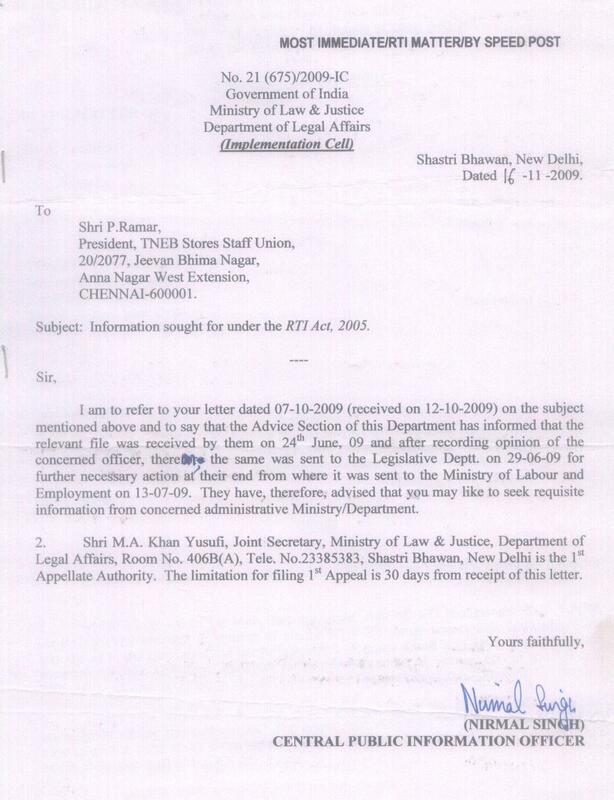 The file, sent by the Ministry of Labour in the Single File System, had been cleared by the Additional Legal Advisor on 26.6.2009, i.e., within two days. 3. 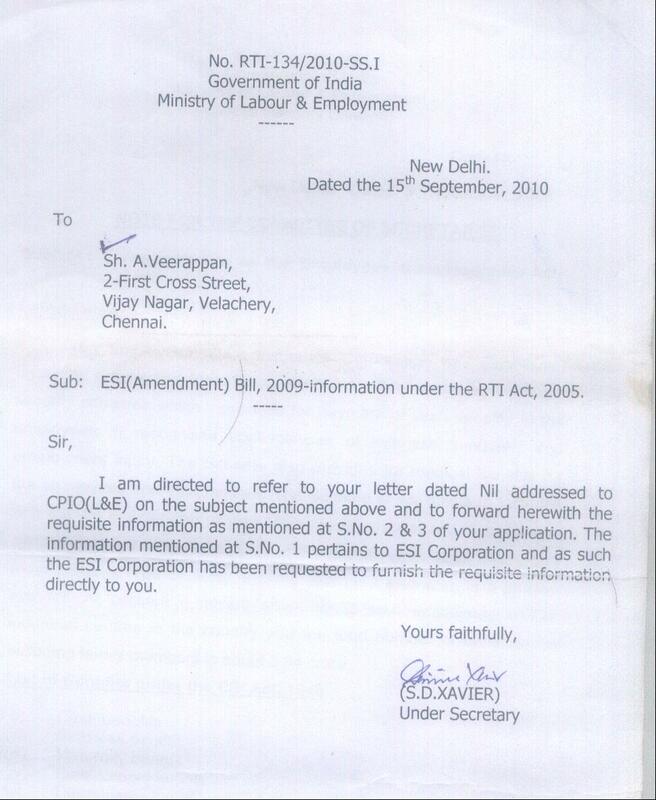 The file was, then, sent to the Legislative Department on 29.6.2009. 4. The Ministry of Labour had, then, tabled the Bill No.66 of 2009 before the Parliament on 30.7.2009. As per the administrative set-up of the Ministry of Law, its Advice Section (or Advice Department) is intended to examine the proposal for amendments “from legal and Constitutional angle”. In the case of the amendments proposed by the Ministry of Labour, the Additional Legal Advisor had said in his Note dated 26.6.2009 that “the proposed amendments are matter of policy and do not appear to be legally and constitutionally objectionable”. Were the amendments proposed in that Bill not objectionable legally, as observed by the Additional Legal Advisor? Really? Did the Ministry of Law render justice to its work? 1. Was the actual version in Clause 5 of the Bill for the amendment of Sec. 17 of the ESI Act, 1948, in respect of ‘appointment of consultants’ in tune with the explanation given in Para 4 (viii) of the ‘Statement of Objects and Reasons’? 2. Was the ‘Validation’ clause, the Clause 17 in the Bill, correctly placed at the appropriate place in the Bill? What were the contents? What could be the consequences? 3. What about the other legal intricacies in Clauses 9 and 15 of the Bill? Were the Ministry of Law required to examine them or not? Or, was there any undue pressure on them to clear the proposal fast without proper scrutiny? The endeavor of this website is to place all the relevant facts before the readers to arrive at their own decision. For that, they have to wait. N.B: This web-site places on record the selfless services rendered by Mr. A. Veerappan and his friends, Mr. P. Ramar, Mr. S. Karthikeyan and others in collecting various details for about two years and also in making them available, now, to this website. The website recalls the sincerety, commitment and devotion of Mr. A. Veerappan towards the ESI Corporation. The remarkable perseverance exhibited by him for such a long duration was very touching. This thread is the result of his efforts. The more of it, later. May his soul rest in peace!